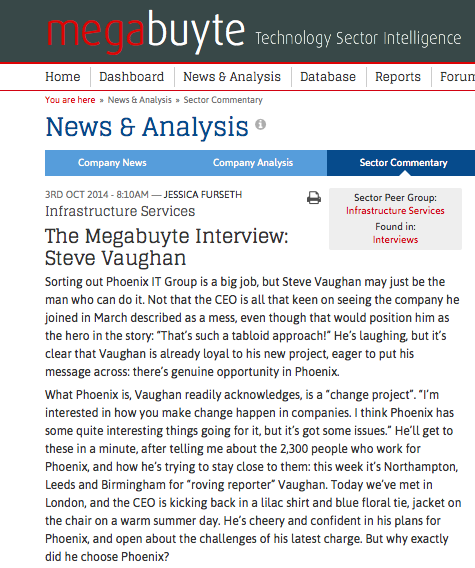 Sorting out Phoenix IT Group is a big job, but Steve Vaughan may just be the man who can do it. Not that the CEO is all that keen on seeing the company he joined in March described as a mess, even though that would position him as the hero in the story: “That’s such a tabloid approach!” He’s laughing, but it’s clear that Vaughan is already loyal to his new project, eager to put his message across: there’s genuine opportunity in Phoenix. What Phoenix is, Vaughan readily acknowledges, is a “change project”. “I’m interested in how you make change happen in companies. I think Phoenix has some quite interesting things going for it, but it’s got some issues.” He’ll get to these in a minute, after telling me about the 2300 people who work for Phoenix, and how he’s trying to stay close to them: this week it’s Northampton, Leeds and Birmingham for “roving reporter” Vaughan. Today we’ve met in London, and the CEO is kicking back in a lilac shirt and blue floral tie, jacket on the chair on a warm summer day. He’s cheery and confident in his plans for Phoenix, and open about the challenges of his latest charge. But why exactly did he choose Phoenix? Then in 2000, just as the hard work was starting to pay off, Vaughan left to run Synstar. I ask if it’s only fun while it’s hard, and while Vaughan laughs, it may not be far from the truth: “Well, yes really! It was definitely job done. I did briefly run the whole of the UK for EDS. […] I felt that if I stayed at EDS much longer I’d probably end up retiring from EDS. So I thought it was time to look at other things.” Synstar was an interesting prospect in terms of size, not dissimilar to Phoenix actually, also in need of a turnaround and lacking in focus. Posted on 10/03/2014 by Jess. This entry was posted in Technology features and tagged phoenix it group, steve vaughan, technology. Bookmark the permalink.